SYDNEY, Australia — They charged their clients fees as they gave bad advice. They charged their clients fees for doing nothing at all. Sometimes, they kept charging the fees after their customers had died. A royal commission appointed by the Australian government released a stinging report on Monday that criticized the country’s powerful banking and financial service industry for bilking consumers, and called for tougher regulations. Loan officers, mortgage brokers and many others acted to line their own wallets rather than helping customers, said the report, which urged the government to rein in an industry that it said too often operated with a cavalier disregard for the welfare of the Australian people. “The damage done by that conduct to individuals and to the overall health and reputation of the financial services industry has been large,” said Kenneth Hayne, who headed the government commission into the financial sector’s misconduct. Treasurer Josh Frydenberg, Australia’s finance minister, said he was “taking action on all 76 recommendations” listed in the report. Still, it isn’t clear just how hard the government would come down on the handful of banks and other firms that dominate finances in the wealthy, resource-rich country. Australia’s economy, which has grown steadily without a recession for more than a quarter century, has hit a soft spot. Demand for its iron ore, coal, meat, milk and other resources has eased thanks to slowing economic growth in China and elsewhere. Housing prices in some major markets are falling after years of increases. Prime Minister Scott Morrison, whose Liberal Party faces a tough election challenge in May, warned before the report’s release that he would watch to make sure lending constraints don’t deprive the country of the money it needs to grow. The report released on Monday is the biggest challenge in recent times for a finance industry that has long operated with impunity in Australia. A handful of local banks dominate lending and deposit taking. The insurance industry is similarly concentrated. For Australian households, that means higher costs when they borrow money, lower interest payments on bank deposits and higher insurance premiums, according to a government study last year. The commission stopped short of recommending that the country’s banking industry be broken up, which critics said meant that the problems could return. The industry and lawmakers unwilling to upset Australia’s economic surge long opposed taking a tougher look at the financial sector. But public frustration mounted after stories of misconduct began to ripple through the country. Australian regulators have said banks could be on the hook for hundreds of millions of dollars that they charged customers for financial advice they never received. The report also cited examples of companies collecting fees and premiums from the accounts of customers who had died. And it highlighted cases in which insurers refused to pay out claims to heart attack and breast cancer survivors, even though they had taken out insurance policies covering those conditions. The royal commission, Australia’s highest form of inquiry on matters of public importance, called for a number of steps to rein in the industry. They include greater scrutiny of the relationships and payment between financial institutions and brokers who often serve as a liaison between them; a closer look at internal rules and whether financial firms encourage sales staffers to break them; and broad looks at culture and governance. “Because it is the entities, their boards and senior executives who bear primary responsibility for what has happened, close attention must be given to their culture, their governance and their remuneration practices,” the report said. The report also criticized the regulators who oversee the companies. “Too often, financial services entities that broke the law were not properly held to account,” Mr. Hayne, who led the commission, said in the report. “Regulatory bodies had significant powers, and they didn’t exercise them for one reason or another,” he said. 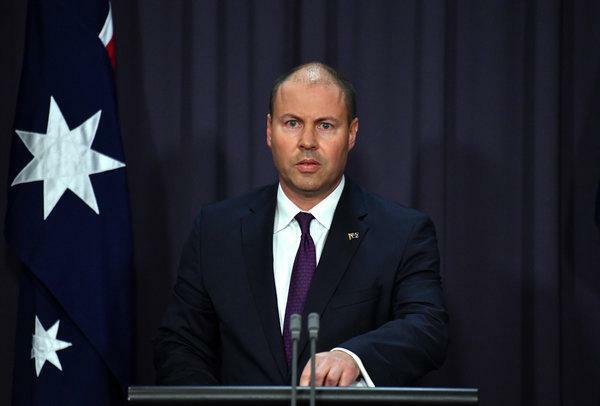 Mr. Frydenberg, also a member of Mr. Morrison’s Liberal Party, offered few specifics of how the government would carry out the commission’s recommendations. He also may not have much time. There are barely five days in the next three months during which the two chambers of Australia’s Parliament will both be seated to pass any legislation. By April 2, the government will set out the federal budget, which is widely expected to be followed by the May election.